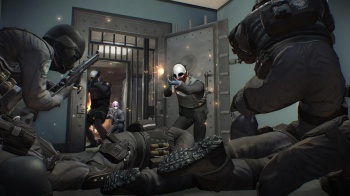 Hopefully you're enjoying the newly-released Payday 2, as developer Overkill Software plans to roll out new content for the next year. Payday 2 is a game centering on theft, specifically the planning and execution of a high-profile heist. That would be a neat premise for a singleplayer title, but the key draw for Payday 2 is that your squad of would-be criminals consists entirely of other players joining you online. If that sounds like a recipe for the caper to go horribly off the rails, well, yes, it's exactly that, but even when one of your crew botches his or her role, the ensuing suicidal firefight with the police is generally pretty entertaining. Doubly so if you spend the entire match quoting Point Break. Point being: Payday 2 is a pretty solid game, which is good news because the development team at Overkill Software is planning a full year of DLC releases for the title, and there's also talk of adding a female character to the otherwise male-dominated world of virtual theft. In a recent interview with OXM, Payday 2 director David Goldfarb outlined the company's DLC plans, as well as his own hopes for a new breed of distaff criminal. "There's like a year of DLC planned; One of the first things I have on my list, is to make sure we get a female character," Goldfarb states. "I'm hoping - I don't know if we'll get it as our first DLC, because we'd have to redo all the animations so it doesn't look like a dude walking around with a female body," he adds. "But I'd like to do that." Why add a female character to a game that centers on activities macho enough to spawn Michael Mann's film career? Beyond the obvious positives of blanket gender diversity, Goldfarb is a father who would one day like to see his daughters enjoy the game on the same level as their male peers. "Because I want, like I said, I want my daughters to be able to - no, I'd need to wait a bit for that - but in theory, it'd be cool for them to mask up. I just think it'd be cool if we had both, that's all. It's definitely on our list. One of the many things that are on our list." There's currently no release window for any of the upcoming Payday 2 DLC, but with the game's apparent retail success we expect more information to emerge very soon. Stay tuned.